Parnassus Records was founded in 1969 to publish reissues of classical recordings on LPs. Within a couple of years, we had taken on what became our main activity until September 2008: mail order sales of classical recordings. Initially, our specialty was classical LP vinyl records, later we added compact discs to the catalogs. While we issued regular catalogs, we also searched for wanted recordings. Our decades in the rare classical LP business have left us with an unparalleled knowledge of the field, and a database to match. 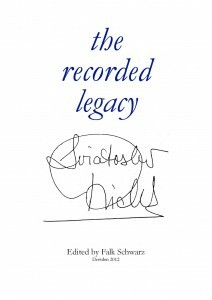 It is this legacy which informs our CD releases, classical record collection appraisals and writing services today. A remarkable work. The result of years of research and dedication. Parnassus Records published historical re-issue LPs many years ago and in 1996 we re-activated our publishing arm, this time focusing on compact discs. Our line includes performances by Sviatoslav Richter (Parnassus Wins Legal Victory) – Colorado String Quartet – Arthur Grumiaux – Janos Starker – Eugene Drucker (of the Emerson String Quartet) – Katherine Hoover – Carole Bogard and many others. We are still in the business of buying classical CD collections. While we buy carefully, we are always on the lookout for interesting collections. Please email us or call us (+) 1 845 679 9686 for more details. We can also provide guidance on selling classical LPs collections. We are constantly listing CDs at amazon.com. Most are open reviewers copies of recent releases. Some will be collectible items from our own remaining stock or from newly acquired collections. Our old site has details of our past activities in the mail order rare classical vinyl LP record and CD business. You can find old catalogs and much more. Please note that the Old Site is now depreciated. We have kept certain pages active to provide historical information and context. Some pages over there will redirect you here.